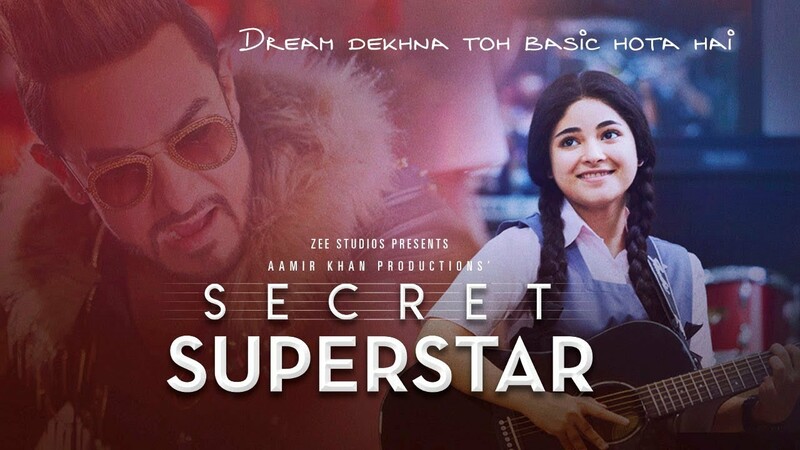 Secret Superstar Song, Movie, Cast and trailer. Starring: Aamir Khan, Zaira Wasim, Meher Vij, Raj Arjun, Harsh Jha, Aryan Ashik, Manoj Sharma and Tirth Sharma. Without veering from the family-friendly dramas from Bollywood playbook, Aamir Khan Productions and Zee Studios beautiful Diwali attraction SECRET SUPERSTAR helmed by debutant Advait Chandan sparkles with that rare quality to address a poignantly spirited and eloquently relevant subject with layers of sly, dark humour enveloped in the theme of dreams, love, life, empowerment and freedom. she grows into a talented teen who aspires to be a singer but the schoolgirl from Baroda is forced to hide her ‘secret’ talents from her dominating father played by Raj Arjun and the world in general. How India fights with the hurdles inside her house which is haunted by the evil of the troubled marriage of her mother Najma (Meher Vij) and wife beating father to pursue her dream of becoming a singer and eventually finds empowerment and the true motto of her life in intriguing turn of events after an encounter with a loud, over the top, arrogant and out of touch musician Shakti Kumar – Aamir Khan in that crotch-hugging jeans making quite a statement. Read Also: Charlie Chaplin| legend of comedy modern Era. Writer-director Advait Chandan who joined Aamir Khan as his assistant in TAARE ZAMEEN PAR seems to the share the same belief in cinema that entertains, enthralls and inspires. Giving a deja vu of the yore with opening credits in Hindi, Engish and Urdu, and the captivating images of a train cutting through a countryside, antakshari in a railway compartment, the fictional saga gets to bang on identification with the ‘real’ people sitting outside the frame as the audience as the rosy cheek India pops her head out of the window to feel the air and have her moment. Ala TAARE ZAMEEN PAR, the influence is inevitable and is used with perfection. Moving in a poetic pace, the movie gets its sly and unexpected dark humour that pokes fun at the world of glitz, glamour, entertainment and media of today whenever Shakti Kumaarr enters and yes sometimes you wonder whether his vivid over the top flamboyance overpower the struggle of young India, but a twist during the end though manipulative that celebrates the feel-good family dramas with that fairy tale feeling sweeps the audience who have a heart. The story takes the center stage, not the superstar. Naysayers will object to its predictability and manipulation targeted to please a large number of audience in the end but it’s impossible for anyone to deny rooting for India throughout. First-time helmer Advait Chandan succeeds in giving a feel-good emotional and inspirational family pack to the audience in this festival season and smartly adds himself into the category of the ‘director to look out for’. The movie is laced with beautiful moments and the dialogues, especially the one-liners are fantastically drawn from life like this one when Najma tells her daughter India after she wins a beat ‘jo cahiye mujhse maang, Zindagi se Nahi’. However in all its positivity, the portrayal of teachers in Bollywood remains caricaturist and unpleasantly loud, such typecasting should end. Zaira Wasim as India is a delightful never-ending charm on screen that captures the audience eye and heart with an extraordinary performance that is outstanding in its effortlessness and amazing brilliant in its spontaneity. She carries the film on her shoulders with amazing poise, right nuances, and responsibility. Exceptional. Aamir Khan is a scene stealer – a vivid mix of music directors, actors from the 80’s 90’s and celebrity judges on TV, even the name seems to be inspired from a popular Bollywood villain, Aamir Khan as Shakti Kumaarr is the cheesy flamboyant at his best. His character comes with tonnes of sly and dark humor on entertainment media and the actor’s nails it with perfection. Using the character as his prop, Aamir Khan delivers a performance that articulates his versatility ‘loud’ and clear. Meher as the mother is completely natural and speaks mostly from her eyes, she is just brilliant. Raj Arjun as the dominating conservative husband/father is just terrific. His terror is felt in the household and amongst the audience that helps in India gaining all the support, love and sympathy. Outstanding. Chintan (Tirth Sharma) as India’s ‘best friend’ is fabulous and Guddu (Kabir) as India’s brother is cute. Production values are first rate. Anil Mehta’s cinematography gracefully travels the trauma, innocence, and flamboyance in the film with an eye that speaks. Special mention to the casting by Anmol Ahuja and Abhishek Banerjee which is bang on. Pallavi Bagga and Suman Roy Mahapatra’s production design is in sync. Priyanjali Lahiri’s costume design is in the right ‘color’ and flavor. Amit Trivedi’s music is soothing, ‘Main Kaun Hoon’, ‘Pyaari Ammi’, ‘Nachdi Phira’ move well with the momentum and lifts your spirits while watching. 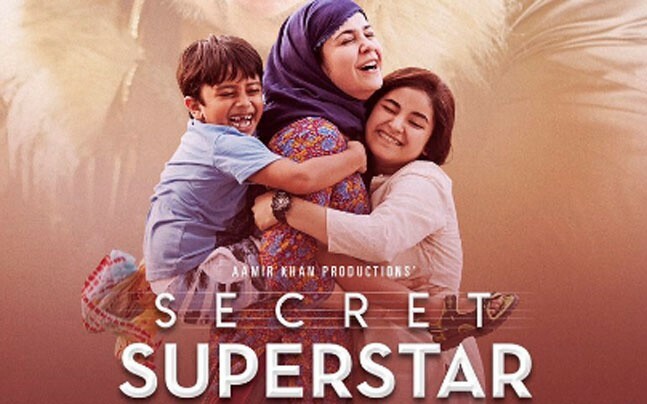 SECRET SUPERSTAR is a sweet little song of dream, hope, love, and humanity, powered by winning acts by Zaira Wasim and Aamir Khan. If you love your family and believe in a dream then don’t miss to follow this SECRET SUPERSTAR near your theatre, you will hug your dreams and dear ones when it’s over.